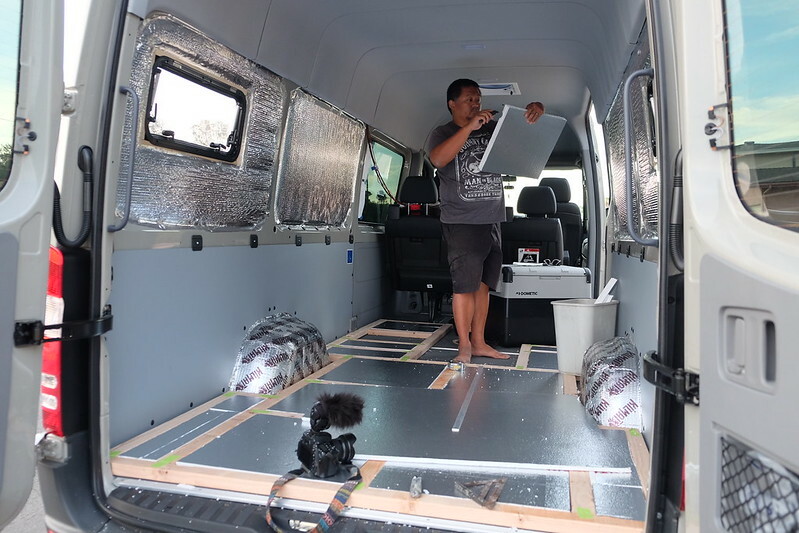 Mali Mish – Sprinter 4×4 Camper Van Build: Day 15. 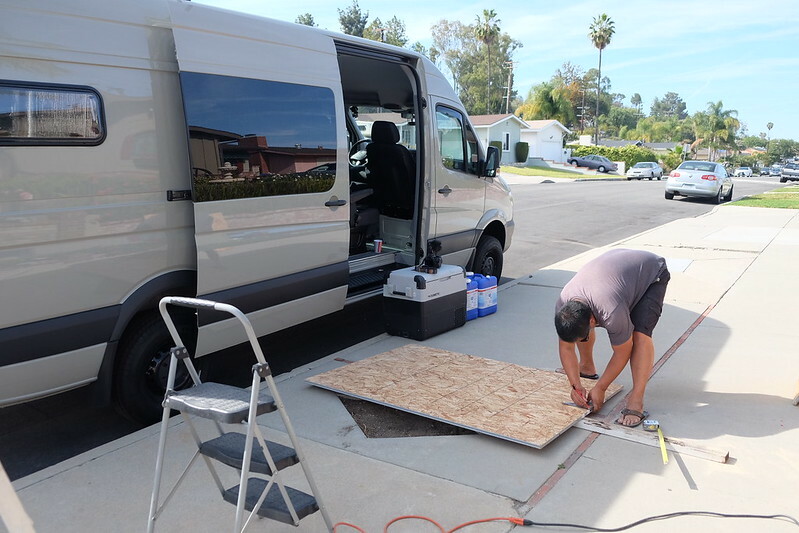 Sprinter 4×4 Camper Van Build: Day 15. A morning trip to two different Home Depots and a Lowe’s got us all the parts we need to start working on the floors and walls. Asking if we needed help when we got back. Thanks for asking, Luka. Also came back with paint swatches. 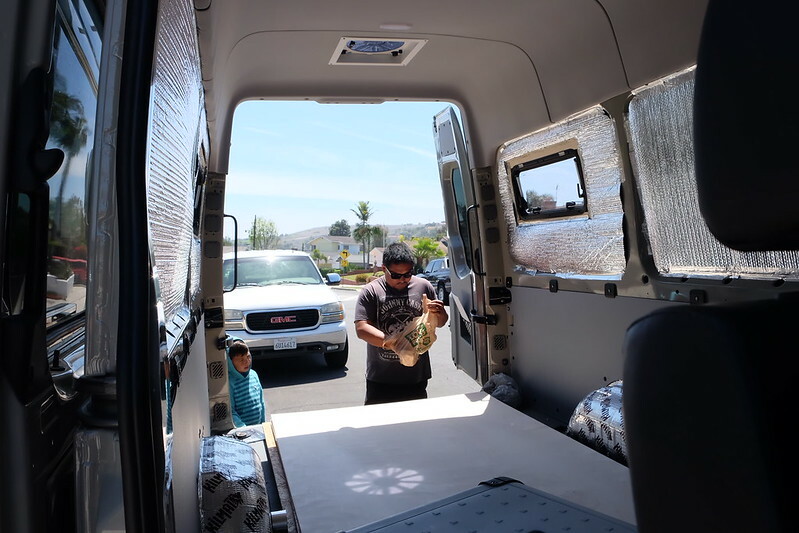 The wooden panel that will cover the mid-section of the van will be painted to a color similar to the headliner color. 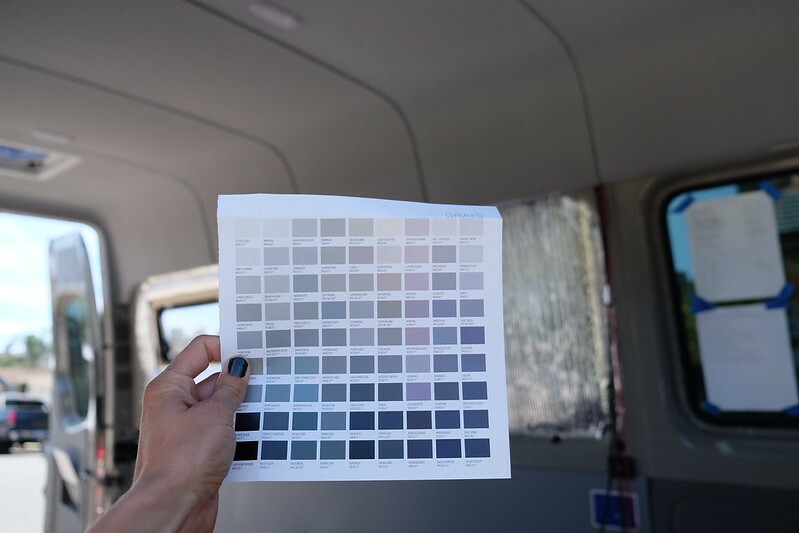 That way the inside of the van will look cohesive. But before we start with the walls, we need to work on flooring. I guess I forgot to take a photo of Dan cutting wood but I did take a photo of the pencil he used. Neigh. Mila decided to hang out with us for a good portion of the day. Helping carry wooden pieces with Dan, measuring with me and being in charge of the music. 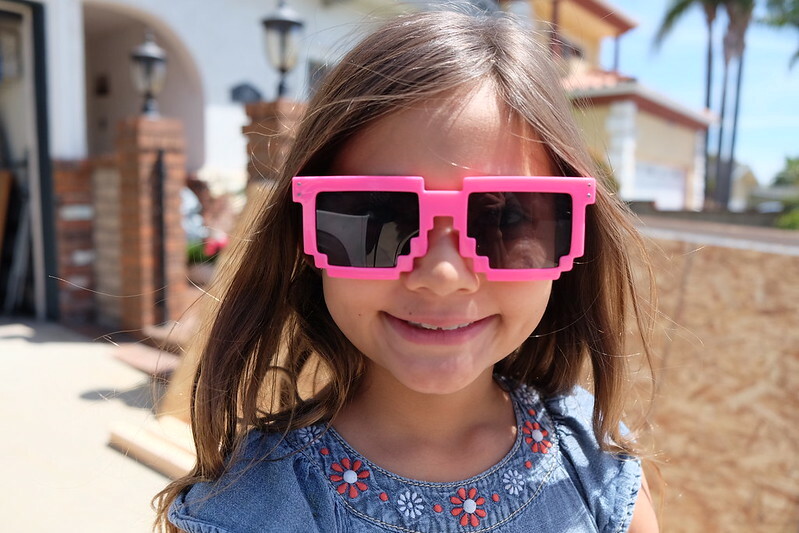 Also, protective eyewear is important for safety… and fashion. Real life math lessons happening today. So what is this? Well, we decided to frame out a floor that will sit under all the things we are building in here. That way we don’t have to drill through the thin factory floor and everything will be removable for the most part. The bed/storage area and the kitchen cabinets will be attached to this beefier 2×3 pieces of wood plus plywood that will sit on top of it. 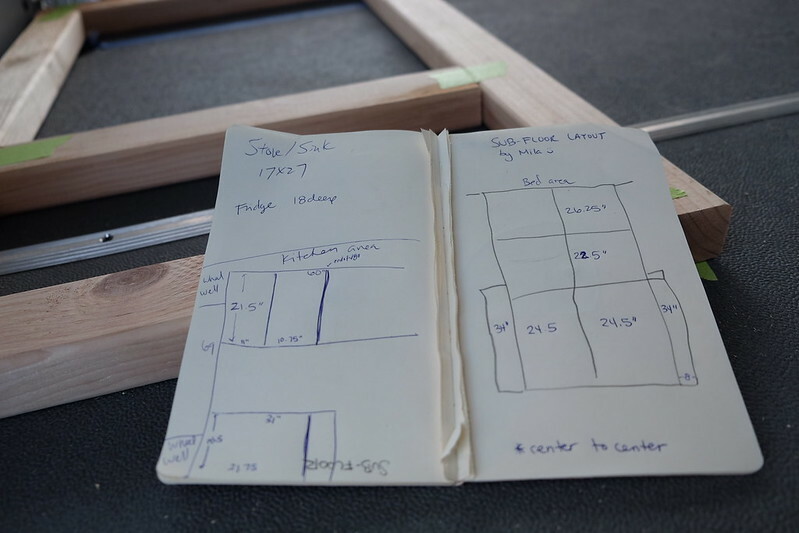 Took notes on some measurements so once we cover the 2x3s with plywood, we will still know where to drill. Time of work on cutting the plywood. Before we lay the plywood down, we decided that adding some insulation would be a good idea instead of leaving it empty. We try to finish our day before dinertime in order to have time to blog and vlog at night but our timing didn’t work out that way today. 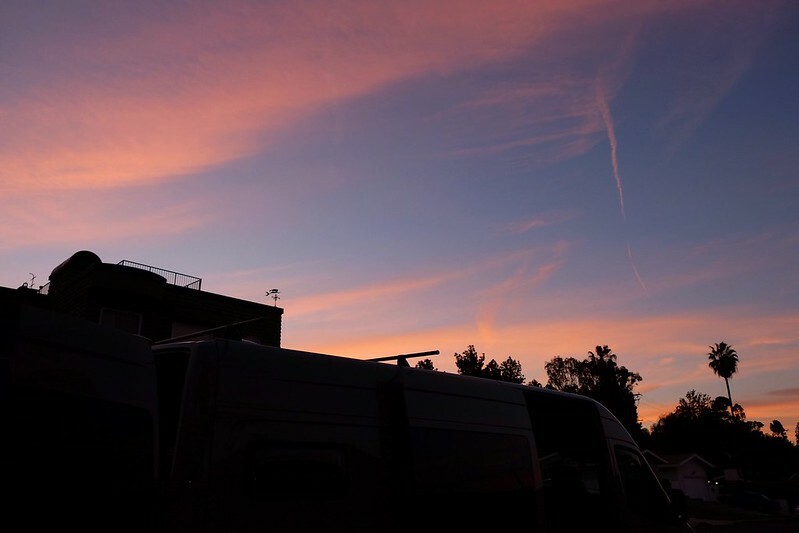 But the sky sure is pretty tonight. OK. It’s dark so Dan temporarily connected our factory headliner lights with new LED bulbs to the batteries so we van finish up the subfloor. It was a long day but also rewarding. Everything will go up from here. Literally. Here’s the video to go along with the day 15 build. Enjoy! 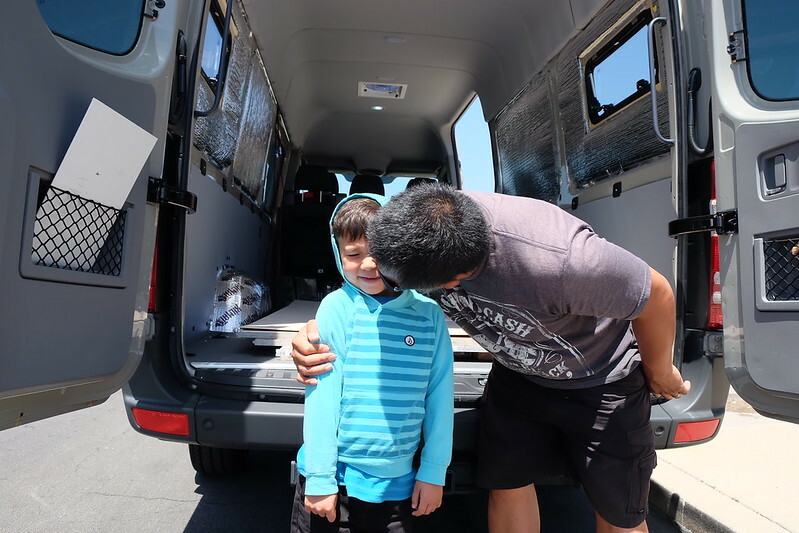 Sprinter 4×4 Camper Van Build: Day 21. 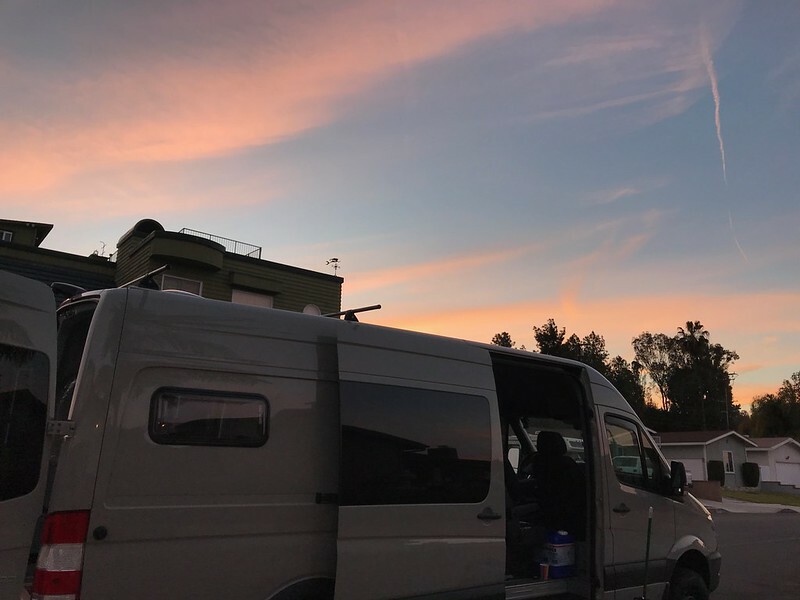 Sprinter 4×4 Camper Van Build: Days 19 and 20. 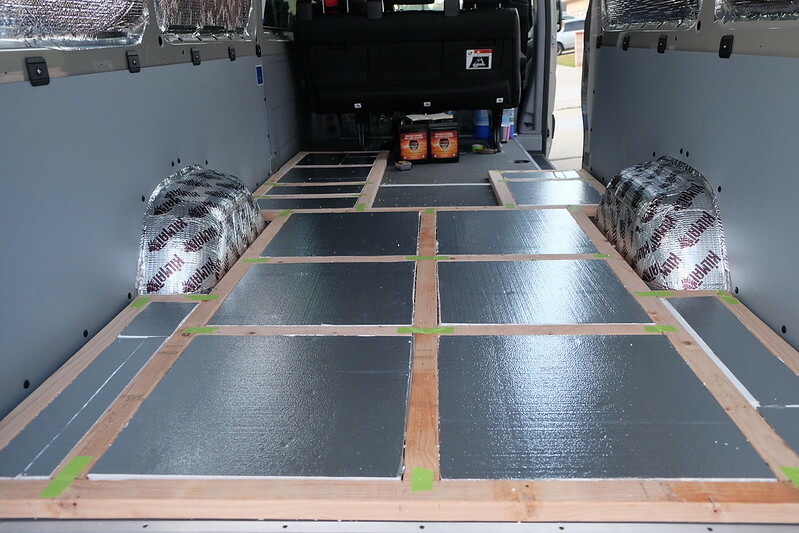 Sprinter 4×4 Camper Van Build: Day 18. 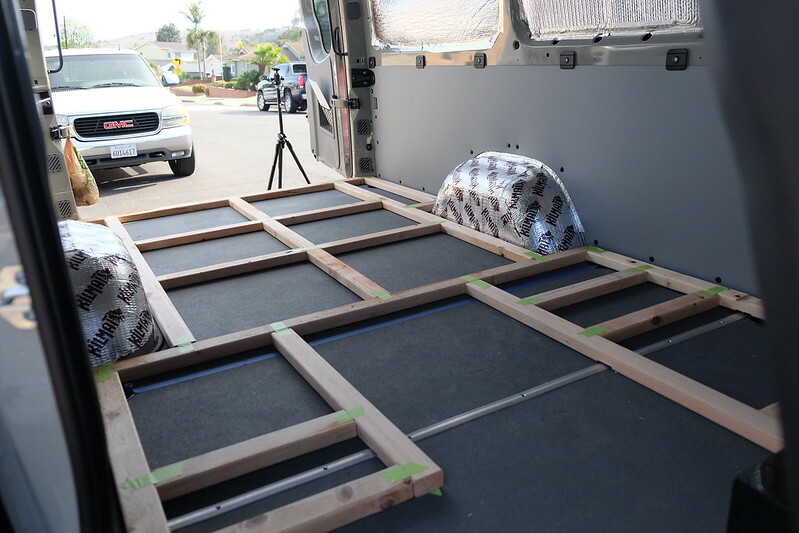 Sprinter 4×4 Camper Van Build: Day 17. 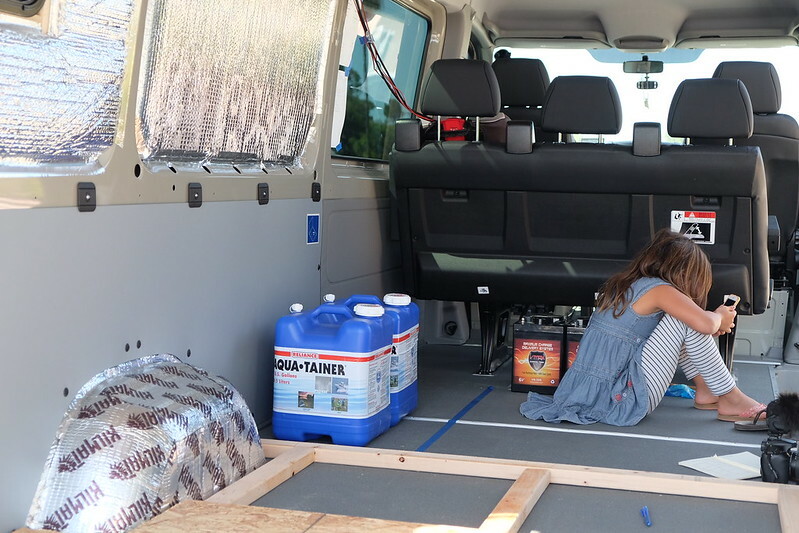 Sprinter 4×4 Camper Van Build: Day 14. 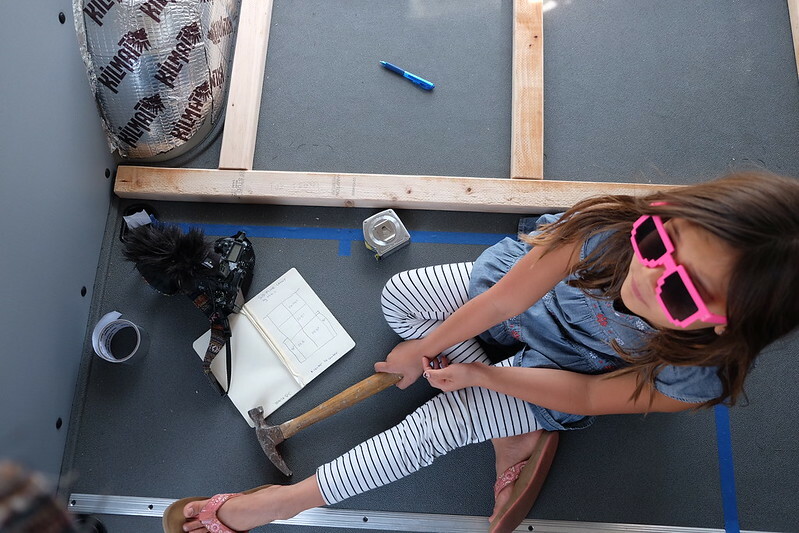 Sprinter 4×4 Camper Van Build: Day 16. 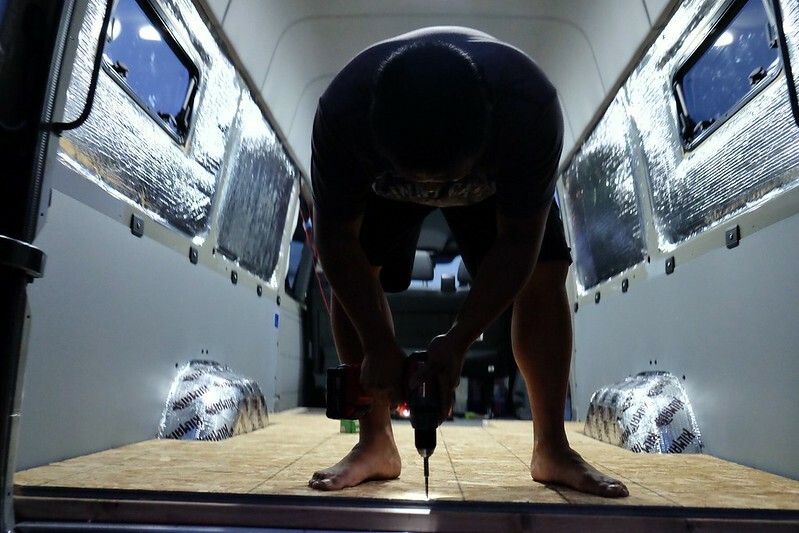 3 Responses to Sprinter 4×4 Camper Van Build: Day 15. So exciting! Thank you for posting. 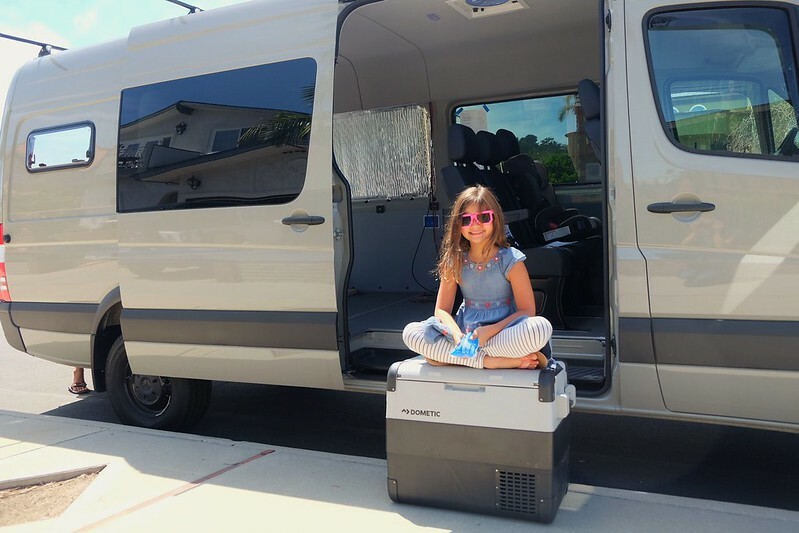 We just purchased our first RV – a light weight travel trailer and upgraded to a Ford F150. exciting. Not sure if we’ll travel full time, but for sure on weekends. We hope to sell our house though and go to one salary. 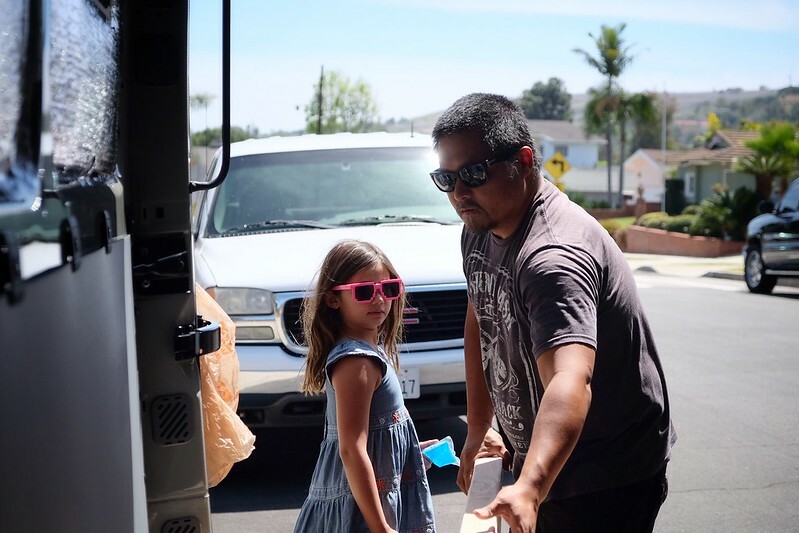 When we drove the truck home last night, our 12 year old stated, “our dream is starting.” so cool! 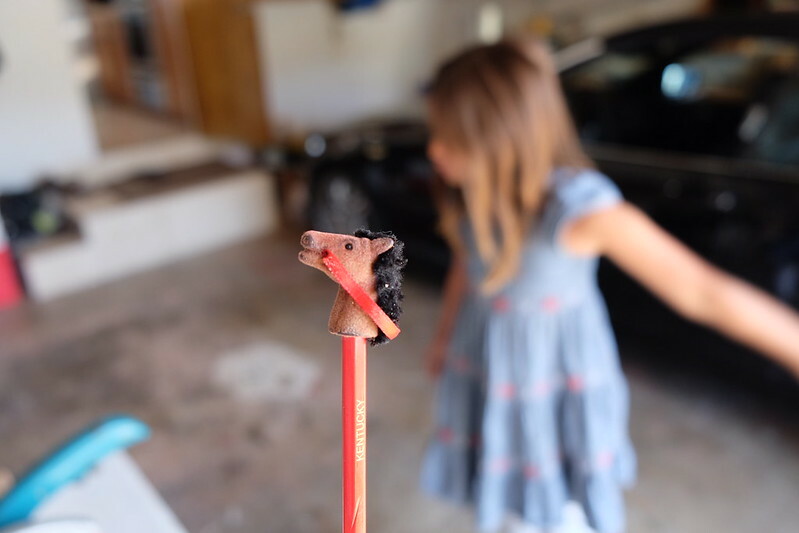 Ever find the horse head eraser on your pillow?